June 2016 – Page 2 – Never Stop Questioning! Ten of Cookie and Brownie’s offspring have shed and eaten their first meal. Ten fat bellies. 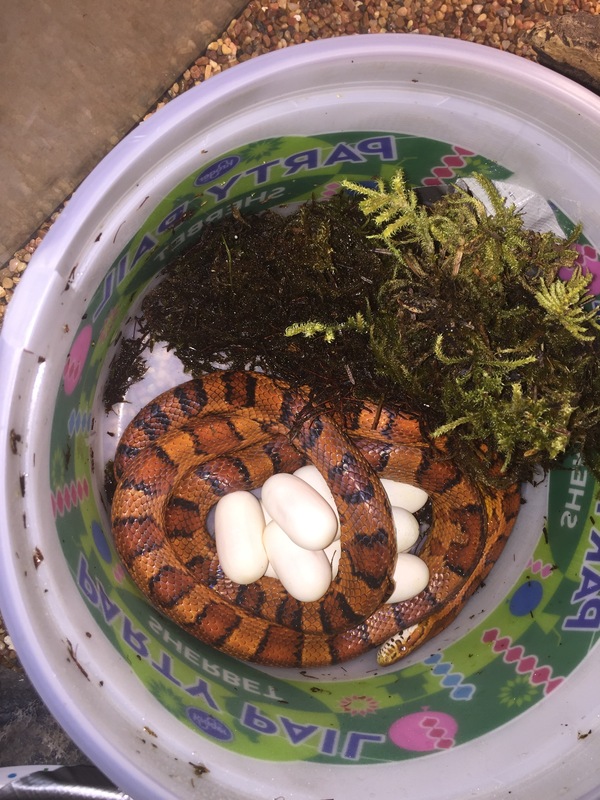 Eating is a HUGE first step towards healthy corn snakes. Of the four that have not yet eaten, two we haven’t tried to feed since they haven’t shed yet. The other two, including little Rainbow, will not eat 😕 We will try again on Wednesday. They will all be ready for new homes after they eat two meals! 6/11/16 – We’ve got Shed! Our first not so little hatchling has shed! Hopefully more will shed tonight so we can feed them all soon. The TEN new eggs are safe in the incubator. Thankfully Cooke was willing to eat a little to rebuild her weight and strength. 6/10/16 – Really BIG news! So I woke up to two monumental events that occurred in the continuing story of Cookie and Brownie. 1) A 14th baby hatched today! A Baker’s Dozen plus one now 🙂 A very healthy looking Okeetee. I didn’t realize there was one last egg until this morning when I went to clean out the incubator and found another little friend. Why was I cleaning out the incubator…..? 2) Yup! 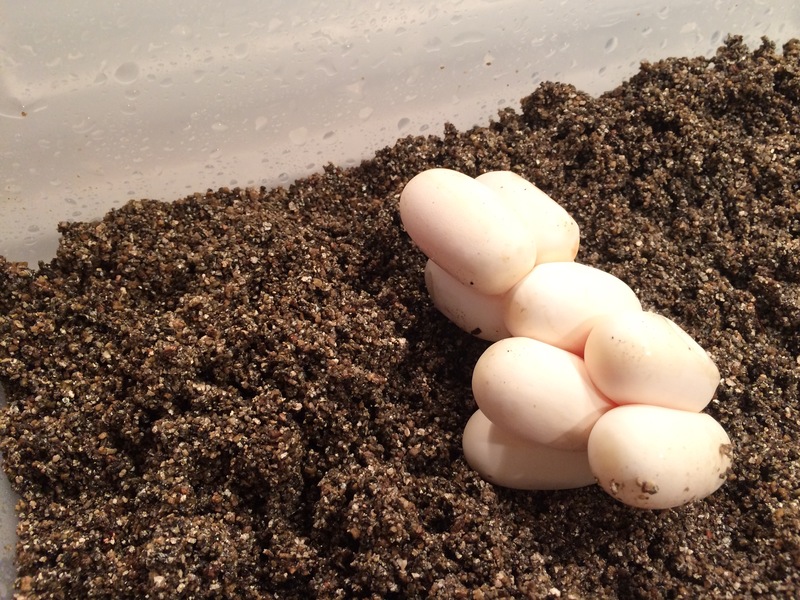 Cookie laid another clutch of very viable looking eggs back in the sherbet tub. Not sure how many are there yet. I’m just going to let her rest today and put the eggs in the incubator tomorrow. Then time to fatten back up Cookie. She looks really lethargic so I’m a little worried about her. Stay tuned for more summer excitement! All of Cookie’s eggs have at last hatched and we have thirteen busy little snakes. Two are amelanistic! Hmmmm.. What percentage is that? The featured photo above gives you a good look at Sherbet, the healthy Amel that hatched second. Zoom in on those beautiful red eyes. Sadly the Amel that hatched first, Rainbow, has a spinal deformity that is called a “kink”. From what I have researched, as long as she eats, makes waste and sheds properly then she can live a long normal life. If you zoom in on the little Okeetee Corn’s eyes you will see they are getting cloudy. Our corn snake handlers know what that means! Notice the babies are out of their incubation shoebox and exploring their new “nursery”. I lined a 10 gallon aquarium with moist paper towels, added two shallow water dishes and added lots of places for them to hide. The heat lamp is on one side. I measured several of the babies and it seems that most are about 25cm long! 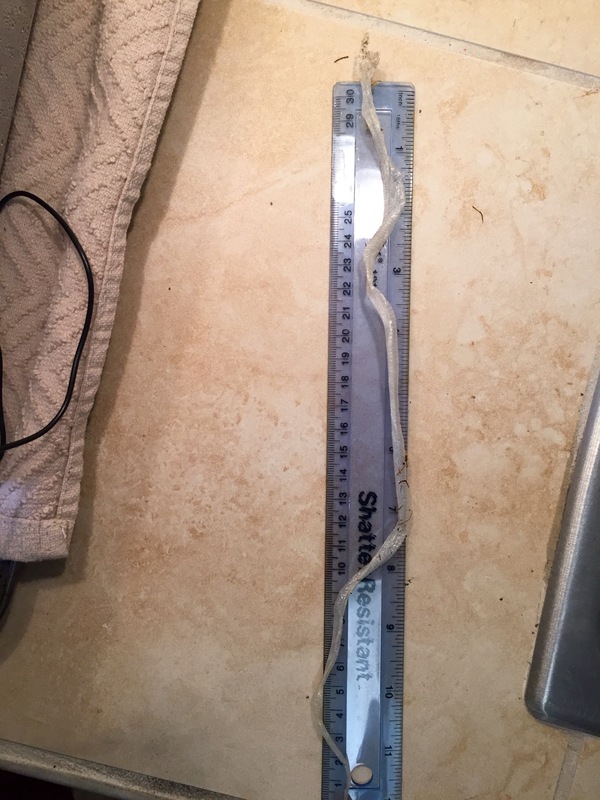 A good healthy size for newborn snakes. The next big event that we are awaiting is for all 13 babies to shed. After their first shed they will be ready for their first meal, a pinkie mouse. I am hoping for Friday or Saturday for their first feeding! This is LC5 alumni, Nicole. You have all heard me refer to her as the “human snake momma”. 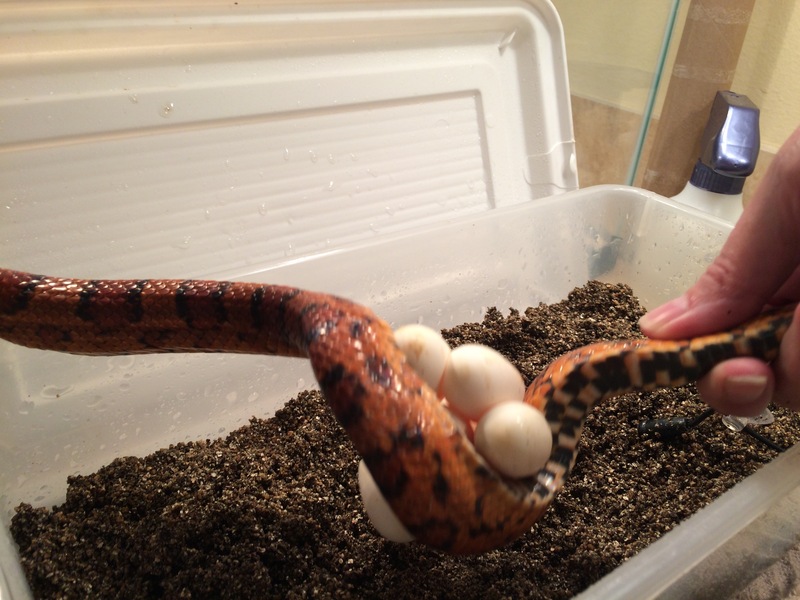 She bred her two Corn Snakes (Ray & Ruby) three years ago and Cookie and Brownie were her first offspring. She of course had to come over yesterday afternoon to check out her next generation of baby Corns and have some play time with Brownie. She is now a sophomore at the Academy of Science and Technology at College Park. I learned from Nicole that Cookie and Brownie had a 25% chance of producing an Amelanistic (red albino) offspring since Ruby was a an Amel. Amelanistic is a double recessive trait so both Cookie and Brownie carry the dominant Okeetee trait and the recessive Amelanistic trait. I know you want to know about “More Hatchlings”… there are more! Many more! AND… we have another Amel. I can’t count them all since they are hiding and I don’t want to disturb anyone. Two more eggs left to hatch. One has a head peeking out. Hopefully they will all be out of the eggs tomorrow and I can do a good count and post more pics. Check out the video below. In the comments share some questions with me and I’ll try to answer them tomorrow. Four siblings are free of their eggs! Bottom left are three little friends. Zoom in on the photo and check out the differences in their head patterns. That’s how we can tell them apart. These I think they are all Okeetee colored due to the black border around their colors. The HUGE NEWS is that we have a little red albino. These are much more rare! In Corn snake lingo this is called an Amelanistic Corn snake (amel for short). See the red eyes. That is because they have no melanin, the pigment responsible for black or brown coloration. 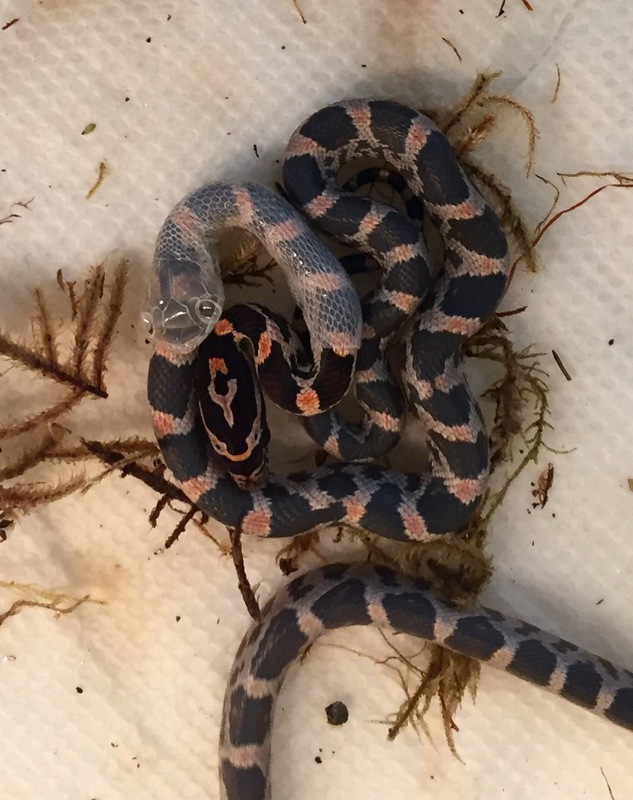 This is actually a color mutation that will make this little friend more valuable to those in the Corn snake breeding world. If you look closely at Rainbow, the amel, you will see she is still attached to the yolk in her egg. Also looking closely at the eggs you should see two more little noses. I am speed reading what to expect when you are expecting CORN SNAKES! Three of Cookie and Brownie’s eggs have little heads peeking in and out of them. A fourth egg has a tiny slit on the top. Nobody has looked out yet. According to Corn Snakes The Comprehensive Owner’s Guide by Kathy & Bill Love most of the babies should emerge from their eggs in the next 24-48 hours. This peeking in and out is called “pipping”. They will do it until they are strong enough to leave the egg completely. The hatchlings make the slit in the egg with something called an “egg tooth” on their snout that they will soon lose. I have looked closely but don’t see that. I wonder what it looks like? Why didn’t I bring home a magnifying glass?! Maybe these babies have lost theirs already. I have one picture to share so far. LOOK CLOSELY. I’m afraid to open their incubator too much. It is at 83°F after me being in there looking around. I had it at a nice toasty 86°F. Mr. Caldwell and I had big plans to go out to dinner tonight to celebrate the start of summer but NOT NOW! Poor Mr. Caldwell… snakes in the laundry room and no night on the town. I will try to capture some video footage. And, “Yes Luke!”… the first two are Rainbow and Sherbet 🙂 What should I call three and four? How many total eggs do you all think will hatch??? I’m sooo excited!! Today was a special day! It was the LAST DAY OF SCHOOL! It is now SUMMER VACATION… SWEET! We wrapped up our final time together in Firehouse Five with talent, hugs, food, gratitude and…. tears. It was sad … the bitter part… to say good-bye to friends that will be moving on. We will miss them and know that they remember all we have shared this year as a family in Five. We hope they will keep in touch with us as they embark on new adventures. The First Day of Fifth Grade! We were SOOOOO excited to meet you!